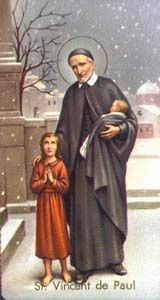 Saint Vincent dePaul was born in France. He was a priest who dedicated himself to ministering spiritually and materially to the poor, the unfortunate, and the suffering. He also focused his energies toward bettering the formation of priests. Together with Louise de Marillac, he founded the Congregation of the Daughters of Charity. He also founded the Congregation of the Mission, known as the Vincentians or Lazarists. His life remained deeply rooted in humility in spite of his worldwide fame. And Jesus went about all the cities and villages, teaching in their synagogues and preaching the gospel of the kingdom, and healing every disease and every infirmity. When he saw the crowds, he had compassion for them, because they were harassed and helpless, like sheep without a shepherd. Then he said to his disciples, "The harvest is plentiful, but the laborers are few; pray therefore the Lord of the harvest to send out laborers into his harvest."